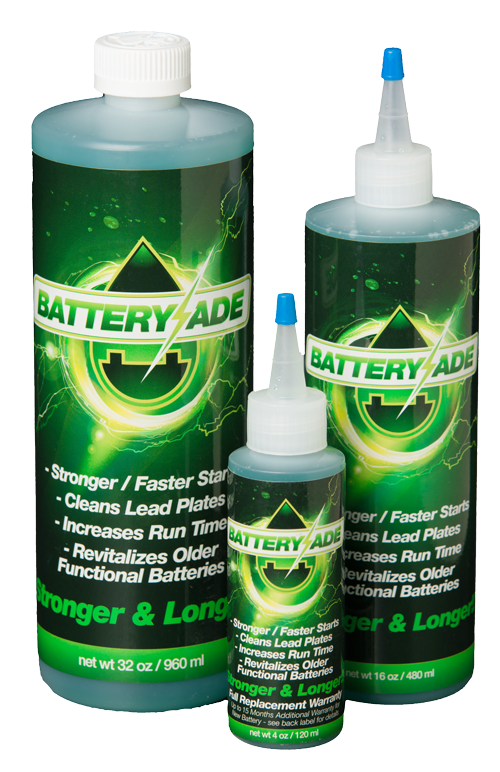 BATTERYADE Battery Additive is an electro chemical catalyst that enhances battery performance. Without BATTERYADE, batteries die a slow death, due to the sulfation process that coats the lead plates inside the battery. Layer after layer of sulfation crystals build up on the lead plates with each charge and discharge cycle until the battery can no longer hold a charge. Another problem occurs when a battery sits idle for several months (winter, summer, between jobs). The layers of sulfation coating the lead plates crystallize and harden like a rock, encapsulating the lead plates. The battery looses its ability to hold a charge the longer it sits between uses. The longer the battery sits, the harder the layers of sulfation become, and the less charge the battery will hold for future uses. Adding BATTERYADE maximizes the battery’s energy output process and highly ionizes the electrolyte making the battery more efficient. In new batteries, BATTERYADE keeps the sulfation from sticking to the lead plates, and recycles it within the battery, so the lead plates stay clean, and the battery performs better having (2 to 3 times) longer life. In functionally sound older batteries that are loosing their ability to hold a charge, BATTERYADE has a 98% success rate in returning the battery back to the ability to hold a good charge. By releasing millions of positively charged ions into the battery, BATTERYADE increases the battery’s efficiency (ability to hold a charge), and begins recycling the sulfating that has built up on the lead plates, back into plate material during the recharge process. Within a couple weeks of regular use, the once tired battery will come back to life.BATTERYADE comes in all sorts of different sizes to match your battery 4 oz Bottle(BA-4), 16 oz Bottle(BA-16), 32 oz Bottle(BA-32), Gallon(BA-1G) and 5 Gallon(BA-5G) with 60ml Syringe(BA-S). Seasonal temperatures also affect battery performance. Cold weather makes engine oil thicker, therefore putting more stress on older sulfated batteries making it difficult to crank the engine. Batteries with BATTERYADE added to them do not have difficulty cranking engines in cold weather conditions, because the battery’s lead plates stay clean, and are full of cranking power!!! The process of charging and discharging will reduce the fluid levels, in each battery cell, over months of use. Hot summer weather increases the operating temperature inside the battery even more, so fluid levels can drop quicker. Check the fluid level in the battery every two to three months, or check them weekly if the batteries are being used daily(golf cart, electric forklifts..) and topping them up off with distilled water only. Insure that fluid levels in the battery stay at least ¼ inch above the lead plates, this will insure the battery continues to function properly. Low fluid levels in a battery will reduce the batteries life. BATTERYADE will not evaporate out of the battery. It is an electro-chemical catalyst that can be added one time, when the battery is new. To extend battery life you can add BATTERYADE every 2-3 years. See Treating Older Functional Batteries process for details.